South Africa is a country of contrasts. 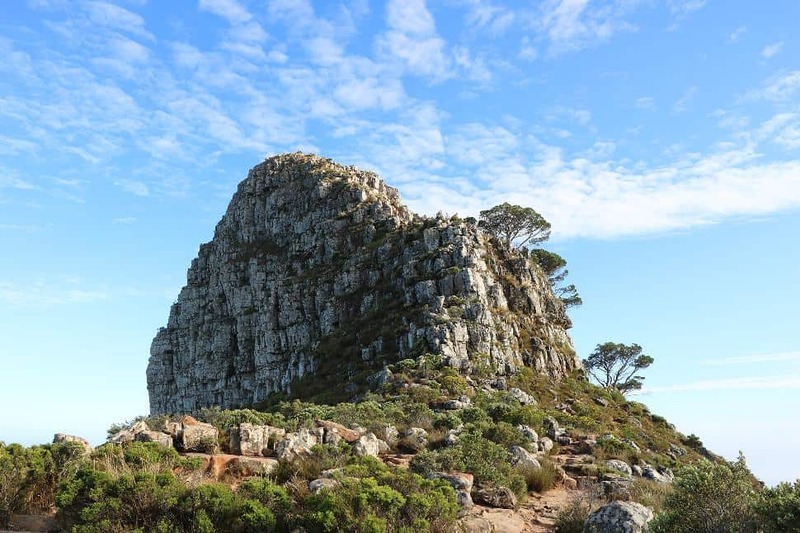 From the barren bush and colourful wildlife north of Johannesburg to the turquoise ocean and sandstone mountains south of Cape Town, there is so much to see and do in this vibrant nation. During my two-week trip, I saw giraffes and lions, penguins and zebras, unique flora and breathtaking sunsets. But my favourite outdoor adventure? 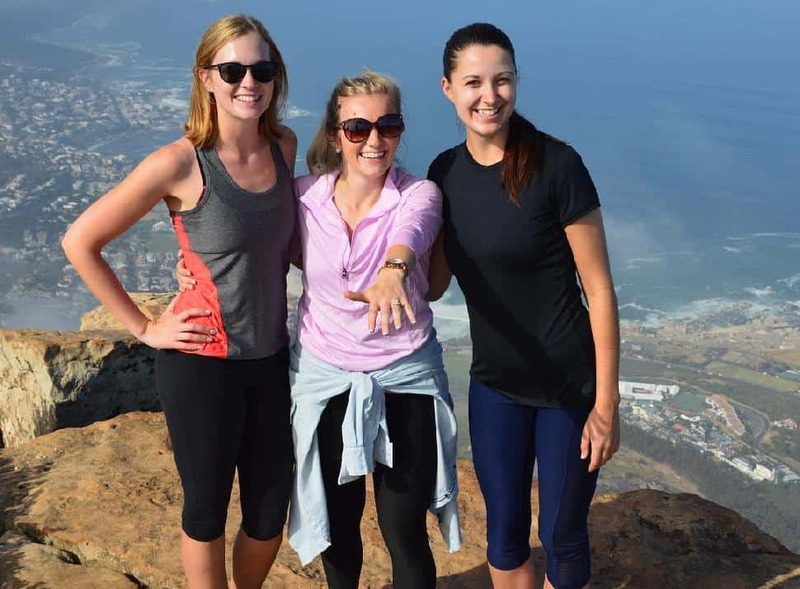 Hiking Lion’s Head in Cape Town for a special surprise. The sun rises before I do. At 5:30 a.m., it’s a struggle to get out of the hostel bed and slip into my hiking clothes. 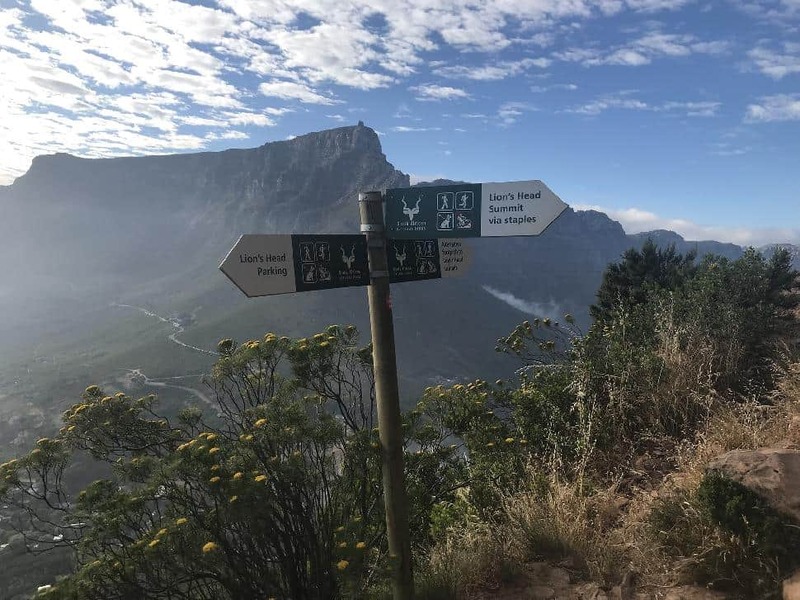 But I don’t have much of a choice—we’re meeting our friends for a 6 a.m. start up Lion’s Head, and with a romantic endeavour planned at the summit, I’m not missing it. 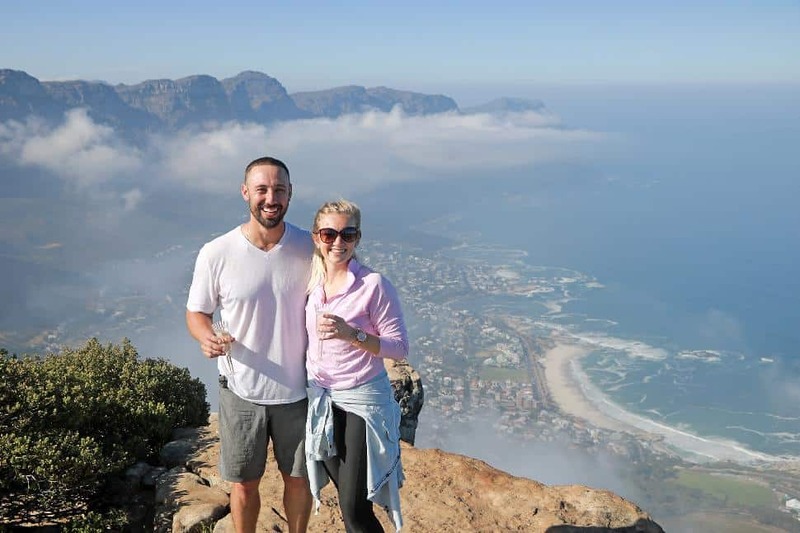 Although not as popular as the famous landmark Table Mountain, Lion’s Head is a safer, scenic option for foreign explorers. 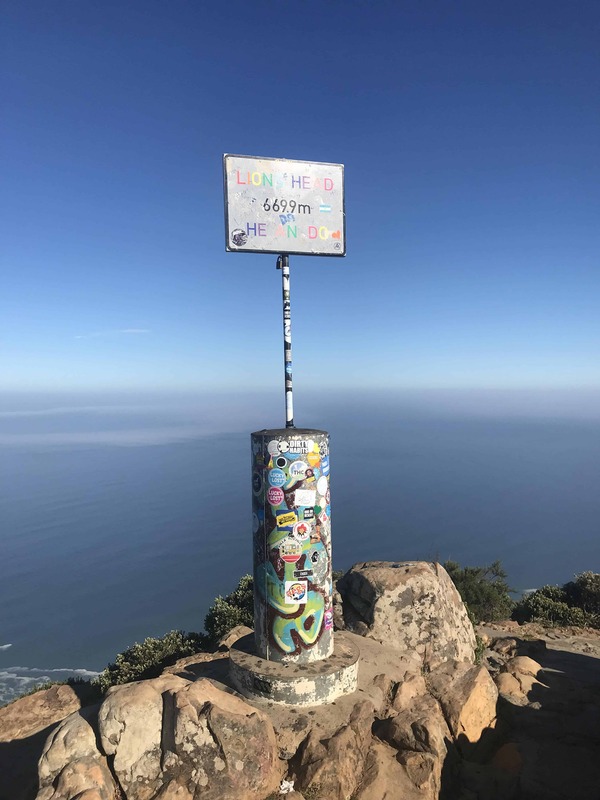 Thieves have been known to stake out Table Mountain, waiting for unsuspecting tourists on the trail. 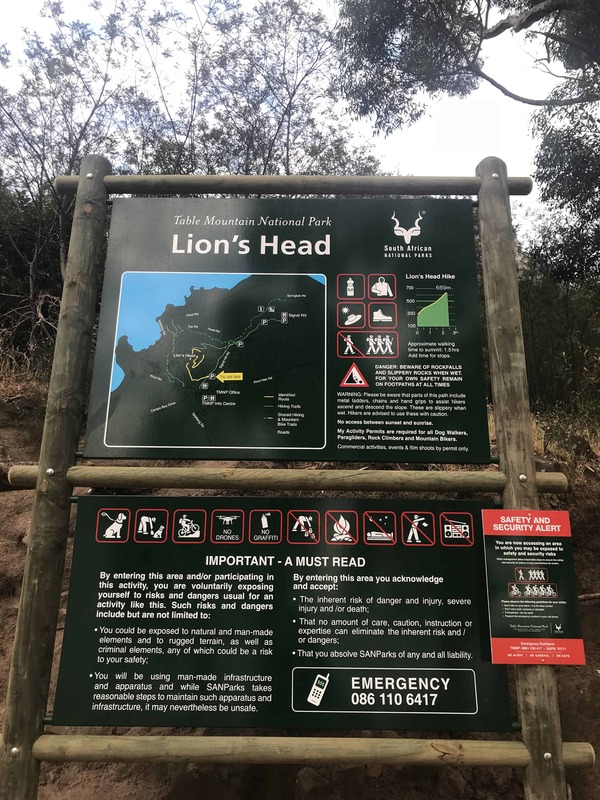 Lion’s Head has less shady places for those with bad intentions to hide. Still, we opt to hike in a group, trusting safety in numbers. Plus, one of our companions carries something very valuable. 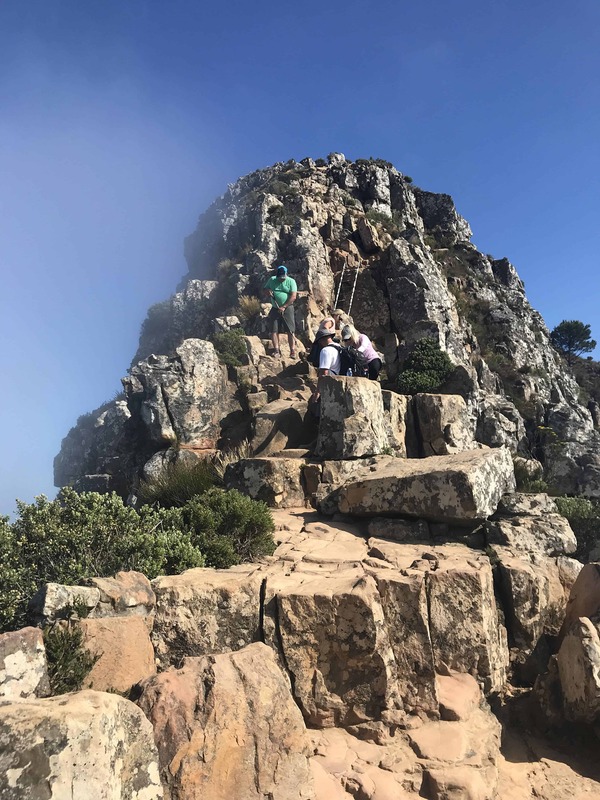 There’s another good reason to hike Lion’s Head over Table Mountain: when you’re on the mountain, you can’t exactly see it. 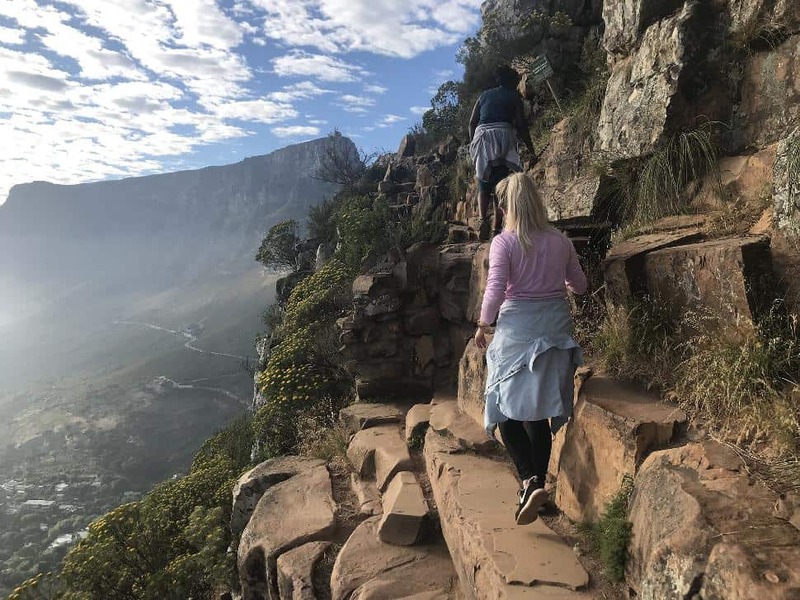 Trekking Lion’s Head offers stunning views of Table Mountain, the Twelve Apostles, Signal Hill, the ocean and the city far below. Our group of six congregates at the parking area at 6 a.m. sharp. A trailer coffee-shop and a large sign mark the trailhead. We begin to circle the peak in a spiral, climbing steadily on a wide, dirt path. 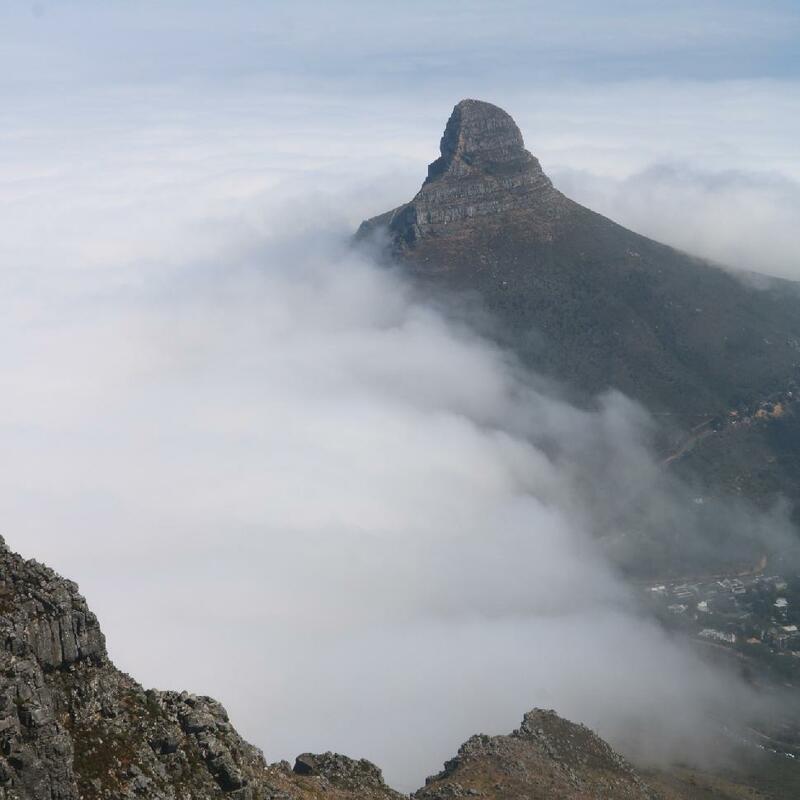 To our left, a grey cloud pours over Table Mountain, akin to smoke sneaking out from the lid of a boiling pot of water. “It’s called the tablecloth,” my friend Robynne explains. 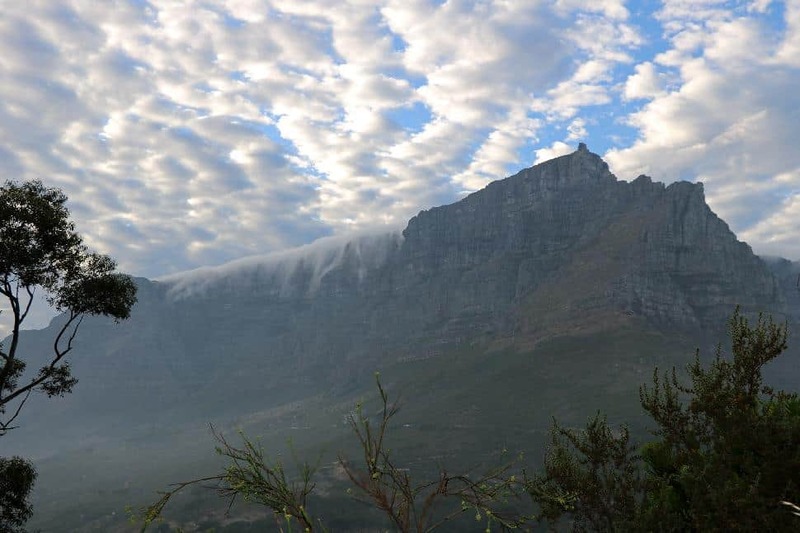 The tablecloth is a phenomenon that occurs when the south-easterly winds blow from the warm waters of False Bay over the Cape Flats and meet cold air on top of Table Mountain. The air condenses, creating a thick mist, and evaporates as it billows over the mountain, sweeping down towards the city bowl like dry ice or a smokescreen—or a white tablecloth being pulled over the flat mountain top. As we continue to hike up, the wide dirt path narrows and fades between rocks. We pick our way carefully along the edge of a cliff. Cape Town lingers some 300 metres below. I try not to look down. Scrambling more than hiking now, the smooth edges of sandstone rock offer rock-climbing hand-holds and opportunistic grips. When we think we’ve reached the summit, we look up to find more rocks to climb. 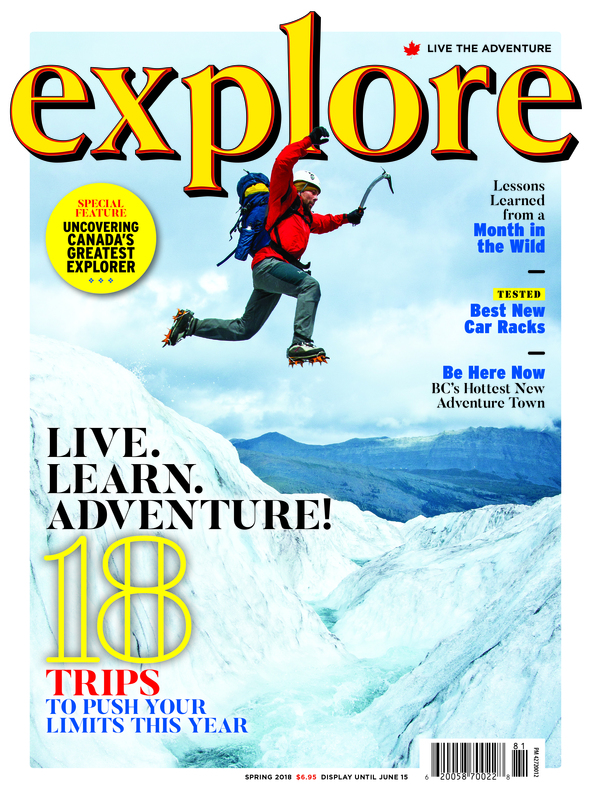 We consider stopping here—but all of us, except Robynne, know why we have to make it to the top. We reach the 669-metre peak at 8 a.m. My friends and I are buzzing with excitement, accomplishment and anticipation. We inch towards the edge of the cliff and take photos of the 360-degree views above wisps of clouds in an otherwise flawless blue sky. We tell Robynne to face out towards the view for a photo, and while her back is turned, her boyfriend, Ricky, gets down on one knee. 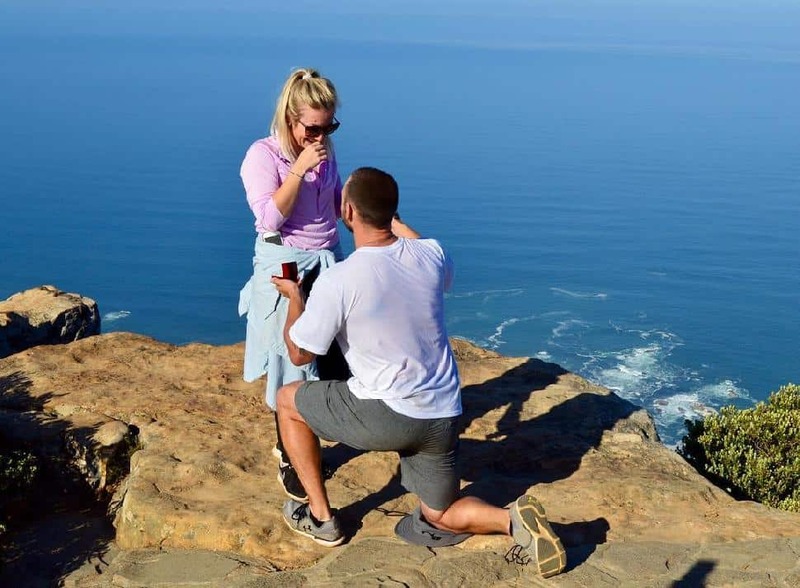 When she turns around, she begins crying and laughing as Ricky proposes. I film, photos are snapped and her parents hold a banner that reads “Marry Me.” She says yes, and champagne is popped. Congratulations and cheers from fellow hikers are shared amiably. Getting up at 5:30 a.m. was completely worth it to be a part of this beautiful moment. Pack sunscreen, a camera and lots of water. The trail is very exposed, so expect to soak in a lot of sunshine on a clear day. We (incorrectly) assumed the hike wouldn’t be that strenuous compared to mountains we conquer in Canada, but trust me—it wasn't easy. We drank all the water we brought and bought more at the bottom. Start early. Even if you can’t wake up for sunrise, start your hike by 8 a.m. at the latest to avoid the sweltering afternoon sun and crowds. The entire hike took us a solid four hours, including time taking photos and celebrating at the summit. Going up is harder than going down. Typically, on climbs like this, I struggle more on the descent. However, thanks to the ladders, chains and natural hand-holds, going down was much easier than going up. Exercise caution. Be careful when climbing the ladders and scrambling up the rocks, and only go as far as you feel comfortable. Stay in a group and keep a close eye on your possessions (especially if you’re carrying an engagement ring). 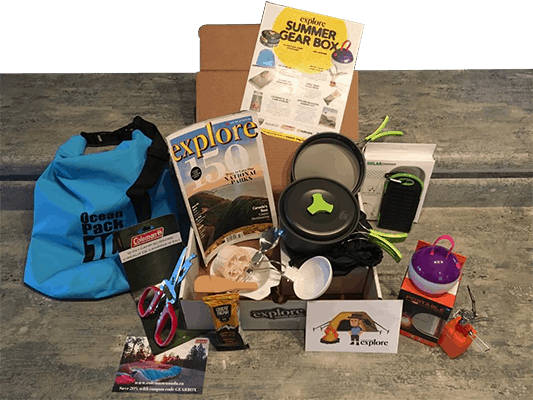 And, as with any adventure, bring along a whistle and emergency kit just in case. 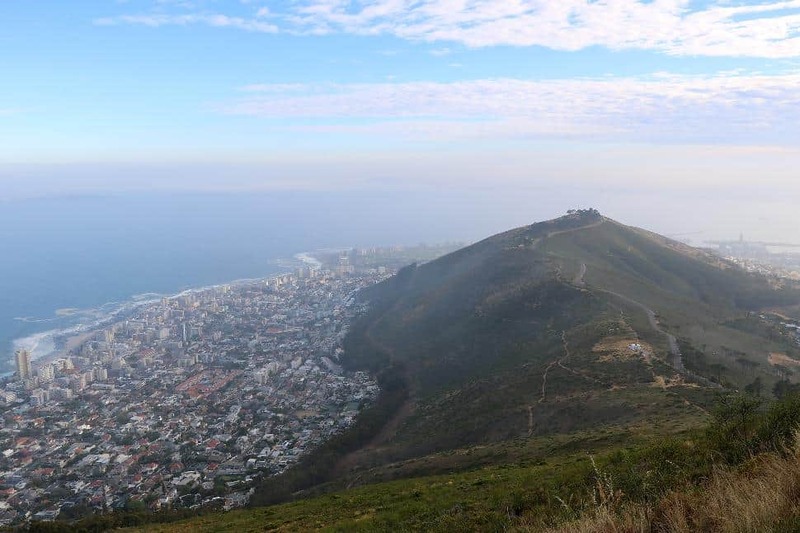 Have you travelled to South Africa for an outdoor adventure? Soaking in the view of Lion’s Head above the clouds from atop Table Mountain ⛰????☁️??????? ?